This is a quick and easy recipe to use up any leftover Roasted Garlic & Chive Mashed Potatoes. If you don't have prepared mashed potatoes on hand then purchase two pounds of russet potatoes and cook and puree them before adding to the soup base. Or you can cook the potatoes in the soup and puree all the ingredients together into a smooth puree. I like cooking the potatoes separately because I like the texture of the sauteed leeks. 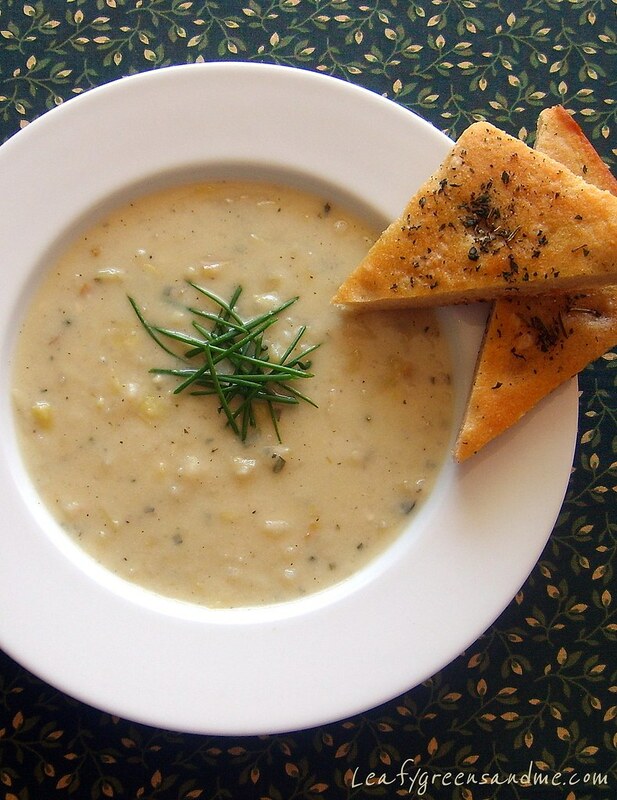 I served this soup with my homemade Whole Wheat Herb-Focaccia. In a large sauce pan, heat olive oil on medium-low heat and add sliced leeks. Cook until leeks are soft, about 5-7 minutes. Add garlic, thyme and white wine and reduce until wine has evaporated. Add mashed potatoes, bring to a boil, reduce to a simmer and cook for about 30 minutes until thickened and for flavors to combine. Season with salt and pepper if needed and garnish with chopped chives. Thanks so much for the nomination. I never heard of the Liebster award before until you mentioned it recently. I will definitely go to your site and read about the rules. Thanks again for sharing my blog with others--I really appreciate it!